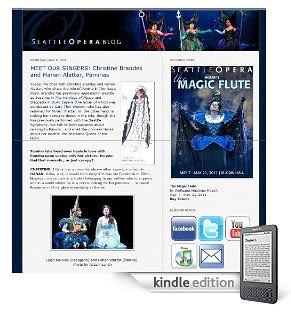 Seattle Opera Blog: Check out Seattle Opera on Kindle! Check out Seattle Opera on Kindle! Now we've also made our blog available as a Kindle subscription, so you can read our artist interviews, see our behind-the-scenes photos, and keep up with Seattle Opera news wherever you are! Kindle Blogs are auto-delivered wirelessly to your Kindle and updated throughout the day, and Amazon offers a 14-day free trial on blog subscriptions. To subscribe or get more info, visit Amazon's Kindle store. Stay tuned for the 2011/2012 season Spotlight Guides, which we'll be posting online soon as PDF and Kindle downloads.